Kate’s arrangements have been performed at many schools around the Greater Vancouver area (Crofton House, Mulgrave, Carson Graham, York House) as well as by Elektra and other women’s choirs around the world thanks to her recent publishing deals with Cypress Choral Music (Vancouver, BC) and Alfred Music Publishing (USA). 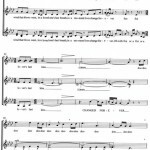 “Changed Forever” is available exclusively through Cypress Choral Music (Vancouver, BC); written by legendary Canadian songwriter, Shari Ulrich, Elektra’s recording of this arrangement is on their 25th anniversary CD, “Pure Elektra” (2012), available through the Elektra website and iTunes. Joni Mitchell’s “The Circle Game” is available through Alfred Music Publishing (USA); Elektra’s recording of the arrangement is available as a single on iTunes and on Elektra’s full length CD, “All My Heart Is Listening” (2014), available through the Elektra website and iTunes. All other arrangements are self-published: $35 CDN per ensemble performing the piece; price includes reference recording if available. Key changes may be possible, depending on voice ranges; Kate is also available to transcribe or arrange on a commission basis – contact her directly to discuss custom arrangements for your choral group. 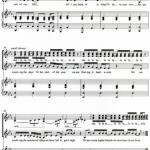 Click on the links below for printed score and recorded excerpts; secure payments are made through PayPal. 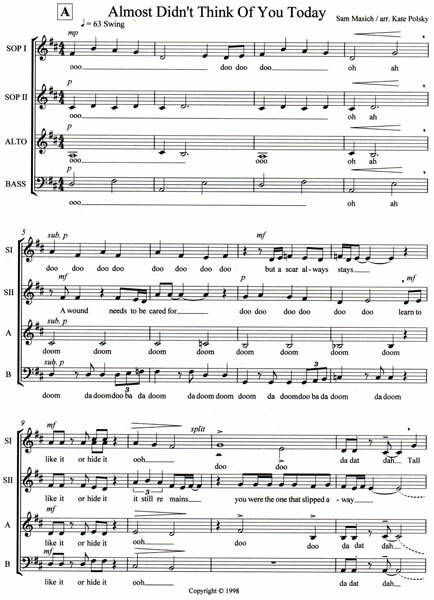 March 2014: Alfred Music released Kate MacColl’s treble voice arrangement of Joni Mitchell’s “The Circle Game” in time for its performance at the ACDA Regional Conference (Seattle, WA) by Elektra Women’s Choir. Scores are available through local music retailers now; the recording is currently available as a single on iTunes and has been released on Elektra’s newest full length CD, “All My Heart Is Listening”. Order the score from Alfred Music. Originally created for Vancouver’s Elektra, this concert arrangement features a soloist as it weaves the melody through every section in the ensemble. Multiple key changes add to the musicality of this delightful setting of a Joni Mitchell favorite. The score can also be ordered from J.W. Pepper — click here. 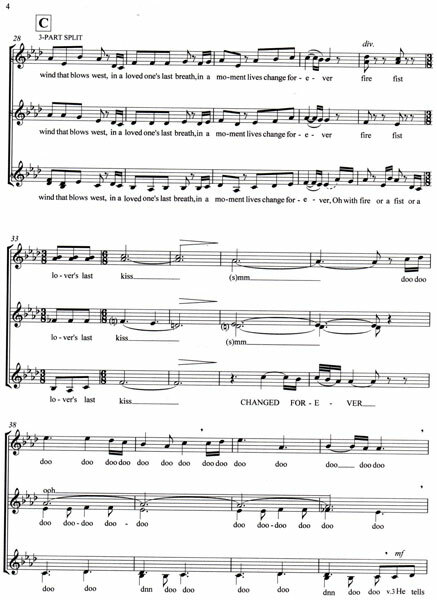 This incredibly romantic song is written in the style of a classic jazz ballad by Sam Masich, and while the arrangement was intended for an SSAB a cappella group, the men’s part could just as easily be played by an upright or electric bass in order to accompany a female group. 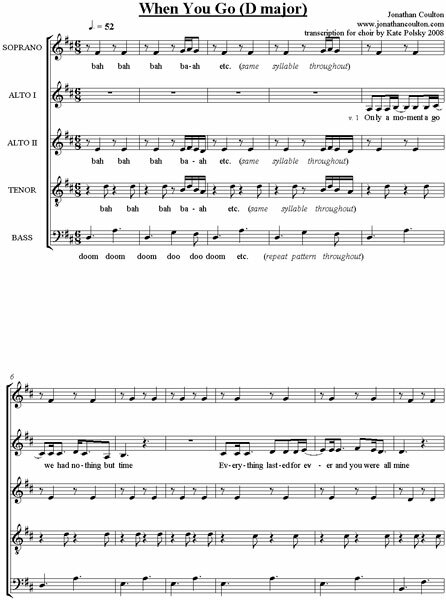 The vocal ranges will suit many levels of choirs, and the beautiful melody and bittersweet lyrics will stay with your singers and audiences long after the song has been sung. 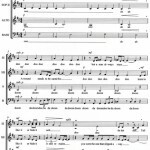 A beautiful song by legendary Canadian singer, songwriter, film composer Shari Ulrich; this a cappella arrangement is for 3-part women’s choir, and was premiered by the world-renowned Elektra Women’s Choir at their April 2010 concert, “Canadian Voices”. 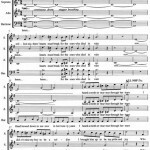 “Changed Forever” has since gone international, with women’s choirs from the States being the first to order this piece. Morna Edmundson, artistic director of Elektra, chose “Changed Forever” to be part of the Elektra Women’s Choir Series announced by Cypress at the 2014 Podium Choral Conference in Halifax, NS. Brooklyn-based performing songwriter Jonathan Coulton was kind enough to give Kate not only his blessing, but also his masters from a recording session, to create a transcription of his song, “When You Go”. 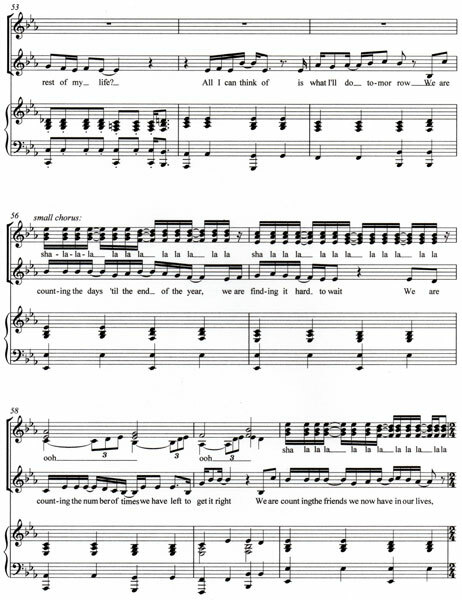 She stayed as true to his performance as possible – aside from changing the key so that it could be sung by a mixed choir – but if you have a high school or adult group ready for a challenge, they will enjoy learning this a cappella love song. 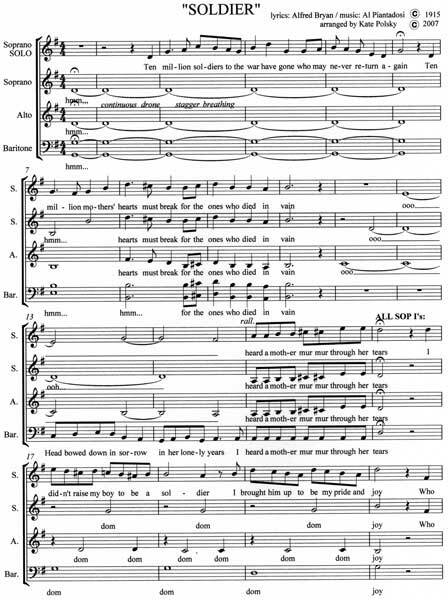 This is an atmospheric choral setting of the text from one of the popular war songs of 1915, “I Didn’t Raise My Boy to Be a Soldier,” by lyricist Alfred Bryan and composer Al Piantadosi. 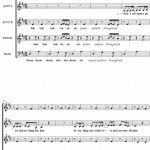 This a cappella piece features a soloist and is best-suited to large choirs or very confident smaller groups, and you must have singers in the baritone range for the SSAB arrangement. Recording not available.